Bridgestone Tires USA is comprised of two prestigious companies, Firestone Tire & Rubber Company and Bridgestone Tire Company Limited. Known throughout the industry as a forerunner of new tire technology, Bridgestone tires come in a wide variety for all types of cars, small trucks and SUVs. Driven by its core message, “One Team, One Planet”, Bridgestone is dedicated to achieving a positive environmental impact.If you are looking to combat the winter roads of the Midwest or simply to just achieve a smooth ride on the highway for your long commute, Bridgestone tires are made to fit your needs. 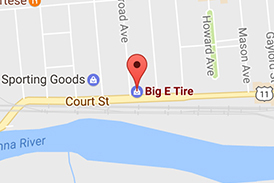 Get A Quote Today on Bridgestone Tires at Big E Tire and Auto – Browse Bridgestone Tires Now!